While playing The Witness for this review, I wrote an email to its lead creator, Jonathan Blow. It was a moment of weakness. I feared that Blow’s magnificent new puzzle game had deadended my ability to reach a solution. I sent it on a Saturday afternoon. “I’ve been playing for much of the day and am having a good time,” I wrote. “I’ve solved a LOT of puzzles.” I listed my accomplishments in the game so far. I needed him to know that I hadn’t buckled early. I view this sort of thing—e-mailing a game developer questions about his difficult game—as a last resort. It’s the thing you do when you’ve tried everything else and are considering, hubristically, that maybe the problem is with the game. You know in the back of your mind that it isn’t, and you’re just a failure. “It’s this one,” I wrote in my e-mail to Blow, “which seems so simple, and yet...” I attached a photo. A lot of puzzles in The Witness look like that. They’re grids, seldom larger than six by six squares. You come upon them by wandering, in a first-person perspective, through the most beautiful island I’ve ever been to in a video game. The island is densely packed with puzzles, some propped up for you to solve, many others masterfully hidden. Nearly all of them (maybe all of them?) involve drawing lines. That’s it. You walk up to the puzzle, then press a button, which locks you in place and produces a small cursor on the screen. You use the cursor to draw a line. In the puzzle above, you just need to draw a line from a circle to a nub. That sounds really simple, but trust me, it’s not. Blow replied quickly, chuckling that that kind of thing happens to him with puzzle games, too. He didn’t say it, but I guess there’s something that happens in your brain when you ask for help; you reassemble the problem and see it from a new angle. I was proud to have figured it out, and to not let Blow get one over on me. That’s one of The Witness’s greatest successes: It creates a wonderfully adversarial contest between its designer and its players. Here’s an early puzzle with just one right answer. You would start by placing the game’s cursor on the circle at the bottom and then trace a line up to one of the nubs at the top. Can you solve it? All across the island, simple puzzles are placed next to slightly more difficult ones, each of which wordlessly teaches the player new rules and strategies. The rules for solving one type of puzzle are layered atop the rules for solving another, which gives the game a powerful conceptual depth. As you play, you emerge from a deep plunge of confusion to bob at the surface and begin to make sense of what’s around you. The more you figure out, the more puzzles you’ll figure out how to access, and the tougher and more satisfying The Witness becomes. I’ve long respected Jonathan Blow’s attempts to do his thing and do it defiantly. He’s suspicious of the way games are typically designed, and was bristling back in 2007 with most video games’ propensity to waste the player’s time with padding like collectibles and scheduled rewards. “I feel like unearned rewards are false and meaningless, yet so many people spend their lives chasing [them],” he told me when I first interviewed him nine years ago. That was a year before he released Braid, the hit time-bending platformer that funded the many subsequent years Blow has spent perfecting this follow-up. The Witness’s rewards lie in solving its puzzles; in avoiding Blow’s red herrings and other attempts to trick and confound you; in seeing how the puzzles iterate and fit into the game’s larger world, how they interrelate. Sometimes the puzzles unlock new areas or more puzzles. Sometimes they unlock nothing. Sometimes they simply allow you to look at what once seemed impossible and see possibility. Always, solving them is a reward unto itself. When I first saw that puzzle, I assumed it was an end-game challenge. Solve those rows, go back to that door, and the knowledge you’ve attained will let you easily solve it and pass. When I look at it now, it looks barely more difficult than long division. Knowing the solutions lets you sequence-break. Replaying the game, I can skip those instructional rows of puzzles and go right to the door. The game has changed me, put something in my brain I didn’t have when I first played it. I didn’t get some virtual ice beam, nor did I unlock a grappling hook or wingsuit. I learned something. Right there, as in so much of The Witness, Jonathan Blow is messing with you. It’s about me, the player, vs. Jonathan Blow. This is a game in which I have solved more than 450 puzzles and I’d say that in at least 400 of them, he was messing with me, delightfully so, teaching me rules for his puzzles and then guiding me toward a puzzle nearby that twists those rules, that takes my satisfied smartass brain and once again shows me how little I know. His game will teach you that a series of puzzles in a forest is about looking closely at trees and then will present a puzzle where looking closely at trees appears to not produce an answer, except of course it does. You’re just not looking at trees properly. The game will seem to demonstrate that solving a series of puzzles will build a bridge one plank at a time, and then that bridge won’t actually close a gap. This is The Witness’ most common mode of operation: a staccato series of encounters in which Jonathan Blow fucks with you. He is very good at it. And I’ll be damned if figuring out how to get past each of his tricks hasn’t been the most fun video game thing I’ve done in a long time. I played The Witness with a notebook nearby, scribbling and sketching possible solutions to dozens of puzzles. I took photos of some puzzles with my phone, so I could compare images. The game is dense with well-hidden puzzles, stumbling only when a puzzle requires aiming the game’s first-person camera just so in order to place the cursor and begin tracing a line. Those sorts of perspective challenges can be too finicky, which hurts one of The Witness’s main types of puzzles. 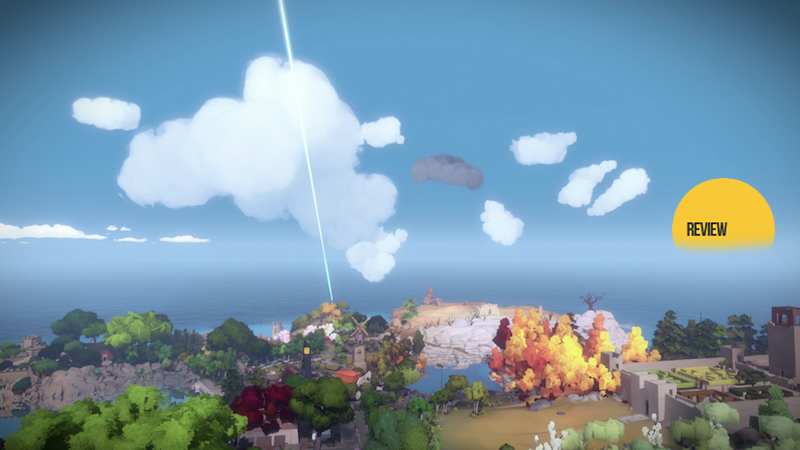 The Witness is a largely abstract game, though it does have a story of sorts. Short, hidden audio files and some videos don’t quite flesh out the narrative—apparently a few that do were not included in my review build of the game—but they reinforce its themes. The puzzles themselves do that as well. A much more deeply-hidden file quotes the spiritual teacher Gangaji reinforces the game’s endorsement of peaceful curiosity over impatient urgency: “...if you choose silence, that is the end of ideas. You are willing to have no idea, to see what is present when there is no idea, past, present, future. No idea of love, no idea of truth, no idea of you, no idea of me. Love is apparent.” In other words, choose silence to recognize the presence of love, rather than actively pursuing it. Those unmoved by this sort of philosophizing will be free to ignore it, as The Witness leaves the explication of deeper thoughts to its nooks and crannies. The philosophy itself, however, permeates the game. Taken as a whole, The Witness makes a statement about the lovely balance of knowing and not knowing. Yes, this is a puzzle game, and you’ll be driven to find solutions to puzzles. You may wish that you, too, could email its designer and ask what you’re doing wrong. It is somehow pleasing, though, to play this game while stumped, to let go of the need for satisfaction and victory.